Rinse medium sauce pan with water. On medium heat, cook 1 cup of milk till a skim forms on top. This is called scalding. DO NOT bring milk to a boil. Remove from heat once skin is formed. Add 1 ½ tsp salt, 1/2 cup sugar and 3/4 cup butter. Stir well. Set aside. Mix with a fork 1/4 cup HOT tap water, 1 tsp sugar and 1 pkg of yeast in medium size glass. Set aside until yeast bubbles up. Beat 3 eggs in small bowl. melted in a large mixing bowl, add risen yeast. Mix well. Add beaten eggs. Mix well. Add 2 cups flour, mixing well. Add 1 more cup of flour. Mix well. Add final cup of flour. Mix well. Cover bowl with saran wrap and let rise. Dough will double in size. This takes from 4 to 6 hours. Once dough has risen, remove saran wrap and stir dough about 3 times. Replace saran wrap and refrigerate overnight (at least 6 hours). Remove dough from refrigerator. Melt 1 stick of butter in microwave. 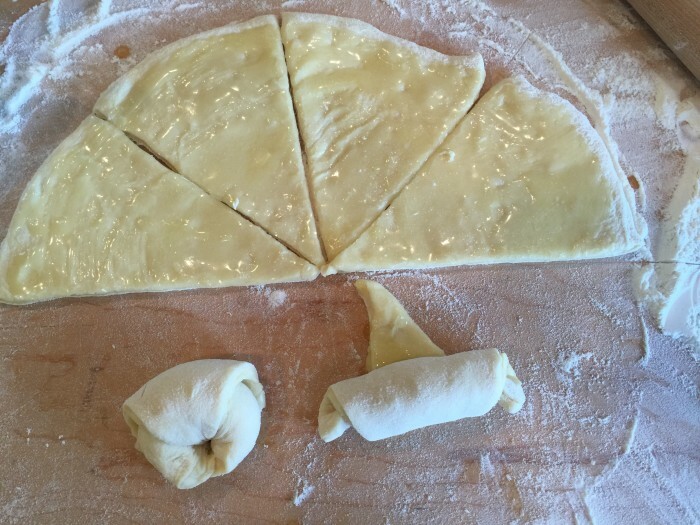 Divide dough into 3 parts. 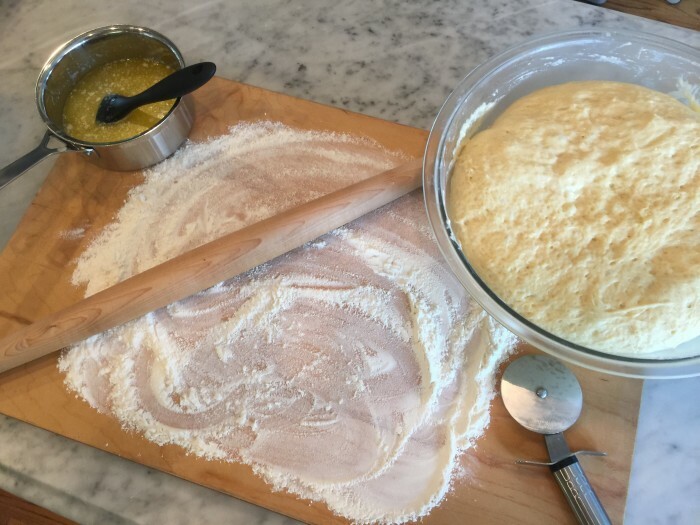 On a floured surface, roll out dough like a pie. 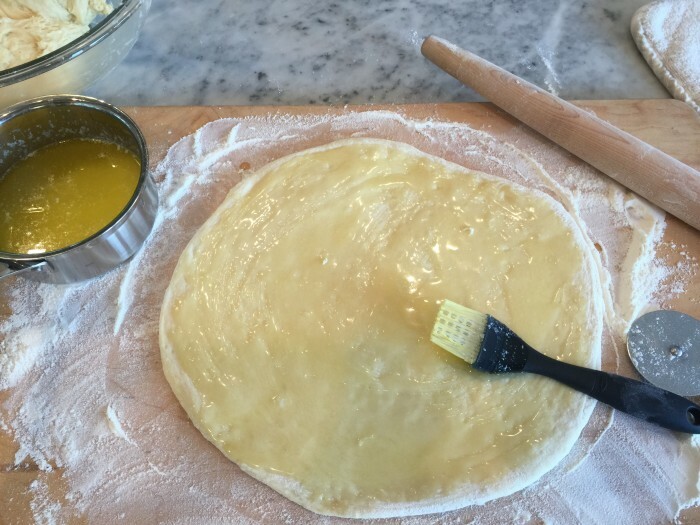 With pastry brush, spread melted butter over dough. Cut into 8 pieces with a pizza cutter. 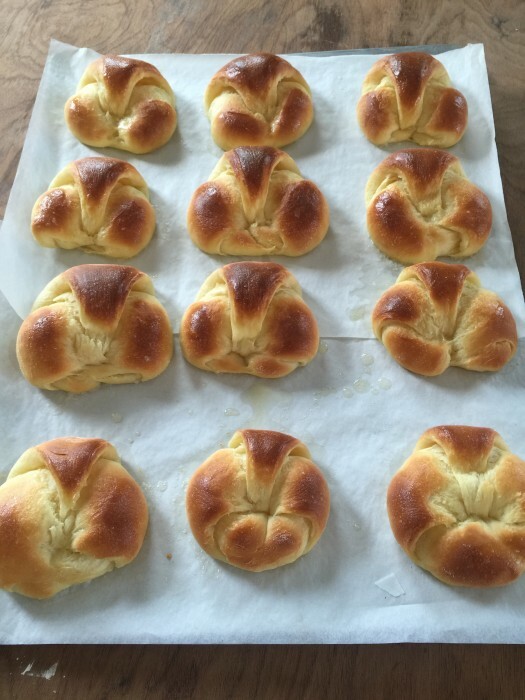 Roll dough into crescent shape and place on greased cookie sheet. Cover with tea towel and let rise till doubled in size (about 2-3 hours). Bake at 350 degrees for 12-15 minutes. Remove from oven when golden brown. Brush with melted butter. Serve immediately or let cool and place in ziplock freezer bag. Rolls can be frozen for up to 1 month. 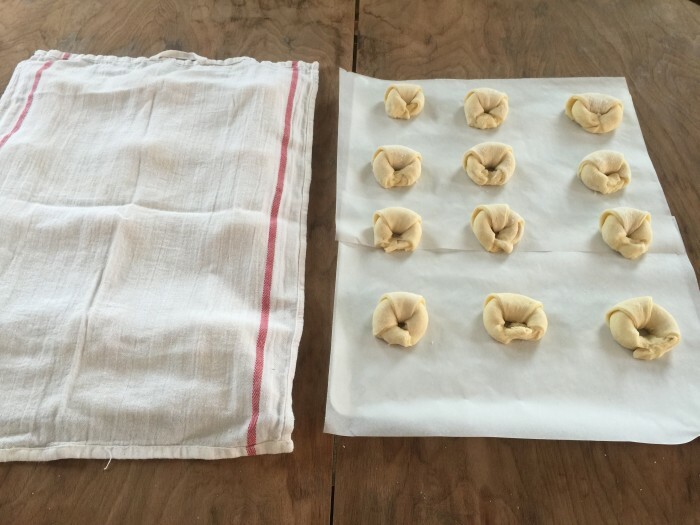 To use after freezing – let rolls thaw at room temperature in bag. Heat on cookie sheet at 300 degrees for 4-8 minutes. evening and refrigerate it overnight. It can stay in the refrigerator for up to 18 hours. You can make it that next morning or wait until about 3 hours before dinner. room temperature. Place thawed rolls on cookie sheet and reheat at 300 degrees for 5-10 minutes.